Internet land is rife with a very angry bunch of people who have nothing better to do than decry certain individuals for being, for lack of a better word, “sellouts”. George Lucas is most famous for this, with message board posts going something like this: “Once, George cared about art! But now, he’s just a businessman, a sellout!” But what exactly is art, or artistic integrity, and what does it mean to be a sellout? These terms are difficult to define. There is this popular notion that the “true” artist cares little about money or success—that everything the true artiste does or doesn’t do is in the sacred name of his art. But just how accurate is this notion? And how legitimate is this hatred for people of film, literature and music spewed by bloggers the world over? was he just a sellout? Most people consider Michelangelo’s Sistine Chapel a true masterpiece. But Michelangelo had little desire to paint the ceiling, doing so rather reluctantly after being pressured by the church. 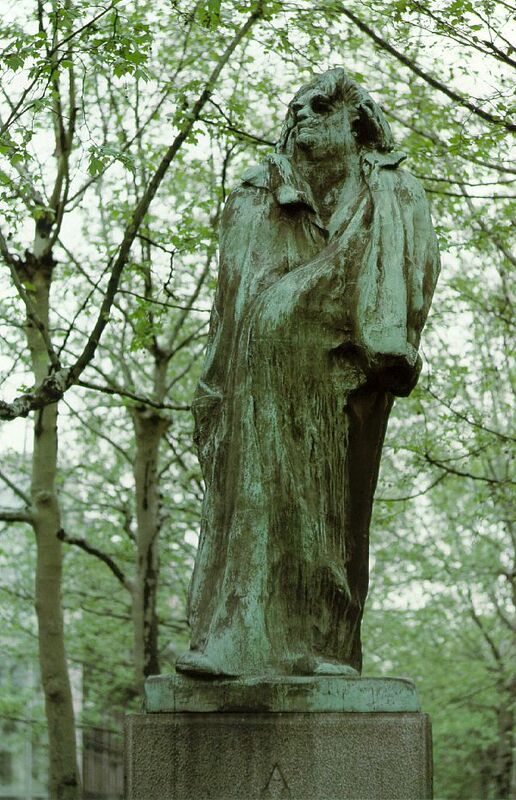 Auguste Rodin, famous for the Thinker, was commissioned by the Parisian government to create a statue of France’s most famous novelist, Balzac. Although Rodin worked enthusiastically for many years on the statue, the completed work was hated by the French, so much so that Balzac’s sculpt was hidden for decades before finally becoming accessible to the public. Like Michelangelo, he did what he was paid to do. But unlike the Sistine Chapel, Balzac was universally panned. Of course, no one today would argue that Rodin was a sellout. If born during the Internet Age, however, I’ve no doubt his integrity as an artist would be challenged. In music, consider the depiction of Mozart in Amadeus (which, I know, is of questionable accuracy). The film depicts Mozart’s greatest compositions being those for which he was paid, including his own funeral dirge. What the public perceives as “art” has little to do with the circumstances surrounding how the art originated and more to do with the end result: does the public think the work any good? Typically, if the work moves people emotionally, it is labeled great art; if, on the other hand, the work is deemed inferior, the artist’s integrity is challenged. The subject of art and business is near and dear to my heart. When I was in college, I rebelled against my creative writing teacher; the first chapter of our textbook insisted that art had little to do with inspiration and more to do with hard work. Since this didn’t feel like the position of the true artiste, I flat out told the teacher the book was bunk and I refused to read it. Due to my passioned argument, he told me I didn’t have to. I wish now I wasn’t so pigheaded; it would have saved me lots of heartache. I would have learned that great art can come from the head as well as the heart, and that, usually, the very best art comes out of a confluence of the two. Unlike Michelangelo or Mozart, some artists with purely artistic intentions churn out garbage; case in point: Lady in the Water by M. Night Shyamalan. This was a movie that, as the director describes it, came straight from the heart, an actual bedtime story he told to his kids. Despite its artistic intentions, the film was universally panned and Shyamalan’s promising career as “the next Spielberg” quickly disintegrated. George Lucas had the same problem with his first art house film, THX 1138, which was based on a student film he made in college. The film was a flop both commercially and critically, and only after succumbing to studio pressure did he come up with American Graffiti. Though Graffiti was largely based on Lucas’ childhood, and no doubt came from the heart, it was financial pressure that pushed him to making it. Decades later, when Lucas made the Star Wars prequels, which he described as the first films he was allowed to make without studio intervention (purely artistic) the films were met mostly with criticism. Many argued that Lucas no longer cared about art—that the prequels were intended solely as moneymakers, but considering the billions he earns running his FX company Industrial Light and Magic, that doesn’t make any sense. If anything, the prequels were a huge expense for Lucas, paid for directly out of pocket. Though Episode I made a fortune for him in merchandising, the expense for the movies could have been split by 20th Century Fox, as the 1977 film, but just as in Empire Strikes Back, Lucas funded the prequels to maintain artistic integrity. Whether the prequels were any good is beyond the scope of this blog, but I’ve never questioned George Lucas’ artistic integrity. Often, art and commercial appeal go hand in hand. I learned this in the most painful way in 2004 when I wrote my first book, which came straight from the heart to become a total fiasco. After a bout of depression and much soul searching, I reevaluated my beliefs and started reworking the book. In the rewrite, I took greater care to consider the interests of the reader. Rather than becoming a sellout, the need for commercial viability pushed me to becoming a better artist. The end product, Age of Aenya, has, in my opinion, greater artistic integrity than the old version. This mode of thinking is contrary to the notion of “art for art sake,” but a whole lot of heartbreak taught me otherwise. I don’t think anyone can say what is in the heart of any artist. I cannot presume to call anyone a sellout. I cannot bring myself to believe that anyone who once cared about the craft would stop caring over love of money. But I do believe that, due to need of money, an artist may direct his efforts toward more commercially viable art. Does that mean he has lost his artistic integrity? No. The two concepts are mutually exclusive but often exist in a state of confluence. I stumbled onto your blog today. I am the wife of Chuck Briceno. He lived in Florida and then moved to New York. He is a writer now, and was a busboy at a pizza place when he was in school. I'm not 100% sure that he is the same person, but I would love to find out and maybe surprise him. My email is jillalex2002@yahoo.com…look forward to hearing from you. Yes, that sounds like the same person to me! Please ask him if he knows a person named Nick Alimonos. He should remember me!